A conference at Treehotel is all about getting away from everyday stress to enjoy the serenity, architecture, surroundings, food and activities that we offer, in an inspiring environment that opens up for creative meetings. The Dragonfly is a well-equipped conference room for groups up to twelve people. 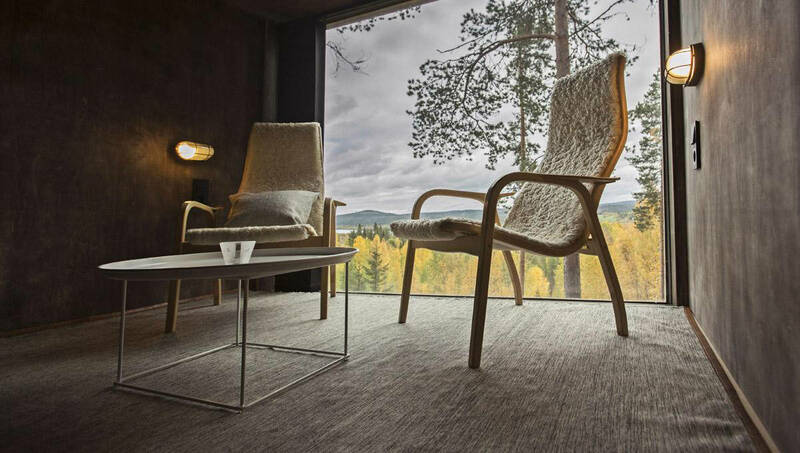 The room, which is fifty square metres, is designed by Rintala Eggertsson Architects. It is mounted six metres above ground on hundred year old pines with a spectacular view. Treehotel always strives for being at the cutting edge of environmental work, architecture and engineering. Our new tree room – The Dragonfly, is clear evidence of our position as nothing similar has ever been created anywhere in the world. The fifty-three square metre and twenty ton room which is mounted six metres above ground is a completely unique creation signed Sami Rintala. The Dragonfly is a well-equipped, modern conference room for groups up to twelwe people. In addition there are four beds divided on two bedrooms. Spend a full day in the most creative environment imaginable. Included: Full day use (08.00 – 17.00), breakfast, lunch, coffee, non alcoholic drinks, ultramodern conference facilities and a spectacular view. Arrive to Treehotel sometime in the morning and kick off your stay with a locally produced and delicious lunch before your conference starts at 2pm. The evening is a perfect time to try one of our activities and enjoy the finest cuisine Swedish Lapland has to offer. The night is spent at Treehotel in shared accommodation. The conference continues in the morning and is concluded with another delicious lunch before departure. Note: Activities are included only in the deluxe package. Bookings for minimum six and maximum twelve people. The conference package for groups looking for something completely out of the ordinary starts with and exclusive reception and an exquisite lunch. This is also where you are introduced to your butler who looks after you during your stay. The conference facilities are available based on your convenience and by sunset we serve selected cocktails in the Five Leaf Clover before the three-course dinner that can be served under open skies if the weather allows. Later in the evening you have private access to outdoor spa and sauna. The conference continues in the morning of day two and the afternoon is spent with our experienced guides in our brand new zip-line course. Bookings for minimum six and maximum twelve people. It would be a great pleasure having you here at Treehotel. To book your conference, please call +46 928 103 00 or send an email to booking@treehotel.se and we promise to get back to you as soon as possible. A visit to Treehotel is about experiencing silence, nature, design and last but not the least, taste. Just like the rest of Tree Hotel, Britta's Restaurant is difficult to compare. It's not about Michelin stars, white table clothes and oyster gloves. It's about food, love and care. It's true we serve only the finest fresh produce that Norrland has to offer. But, without love and care, Britta's would merely be a very good Norrland restaurant. Our meals are carefully composed of fresh, wild, local produce, and it is a pleasure to invite you to dinner. A well-stocked wild game buffet is served daily. Almost all fresh produce is local and to the greatest extent, organically grown. Svantes Vilt och Bär, our key supplier of game, is located about one kilometre from Treehotel. Since we’re very particular about all ingredients being of the best quality, we change our menu daily depending on supply and season. If you want to know exactly what is being served today, please contact us. The buffet price, including two main dishes, bread, salad and alcohol-free beverage. Perhaps you prefer table service? We'll gladly compose a three-course meal just for you. At Treehotel you can experience the charm of all four seasons, regardless of whether you like speed and adventure, or tranquility and time for reflection. Want to experience the beautiful winter with its stark contrasts of dark skies against glistening white snow? An action-packed dog sled ride through the frozen landscape, or a calm and quiet snowshoe hike in pursuit of the magic and myth of the northern lights? Ice melts and greenery explodes after the long sleep of winter. Why not experience the arrival of summer and its bright nights while on horseback, moutainbike, or peacefully by foot? During the most colourful of seasons, it’s a rare experience to paddle a kayak along the historic Lule River and enjoy the autumn’s fresh, clean air. And, if you like fishing, you have access to good fishing waters all year around. Read more about the activities here. Treehotel offers a unique experience with modern tree-rooms in the middle of a pristine nature. With six different rooms you’ll get the chance to stay in a comfortable and exiting surrounding where you will be inspired by both architecture and nature. Recharge your batteries or enjoy the view from the Dragonfly with a glas of wine after a productive day. Our tree-rooms will make your conference in to a memorable event. Check out all of our rooms here.